The app you can watch online for both Android and iOS (iPhone, iPod touch, iPad) for free on Google Play Store (Android) and iTunes App Store (iOS) Download. This gives us access to numerous, mostly German channels. Here, however, are international broadcasters. Via Zattoo can view eg ARD and ZDF in livestream. Private channels like ProSieben, RTL, Sat 1 and Co. can therefore not be considered. Although no live stream, but who wants to watch a variety of shows and movies on the go, who can download the free app dailyme TV. New episodes can be downloaded via Wi-Fi or 3G (mobile internet) and viewed. 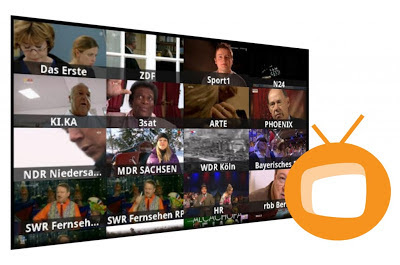 Numerous programs and series, especially ProSieben, Sat 1 and Kabel 1 are supported by dailyme TV. Including: pop stars, Galileo, The Great SAT.1 film, Switch reloaded, the last bull, K11 - Commissioners in use, SPORT1 TV News, taff, Comedy Street, Quatsch Comedy Club, The Three Dreisten, Kesslers Knigge, adventure car, Attention Control , Richter Alexander Hold, Two. Bons, Low and Kuhnt, We are Family!, Britt, and more But Internet programs like "GIGA TV" are supported by Zattoo. dailyme tv are available for both Android and iOS (iPhone, iPad).